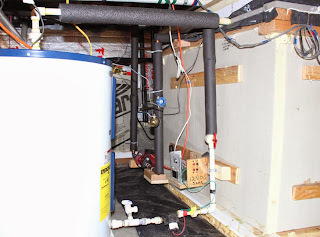 Our $2K solar space and water heating system provides solar water heating and also space heating to part of our house. Until recently the backup heat for this part of the house was a propane forced air furnace that came with the house. But, last winter the furnace died and the replacement cost was $6000. 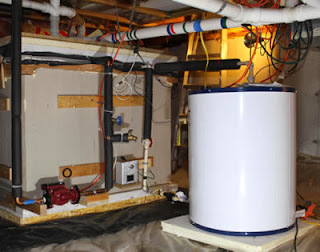 So, instead of replacing the furnace, we added a backup heat system that just adds heat to the large solar heat storage tank when there is not enough sun to keep the solar tank warm. This approach cost about $300 (pretty good saving), and has the advantage that we no longer have a noisy and potentially unsafe gas furnace hung from the floor just below our bed. The new backup heat system is pretty simple. Its just an electric hot water heater that sits next to the solar tank with a small pump to circulate hot water from the electric tank to the solar tank when the solar tank temperature drops below a setpoint. The heat is distributed to the room above by the same radiant floor pex tube system as before. and the solar tank is at the bottom of the picture -- only 15 watts. 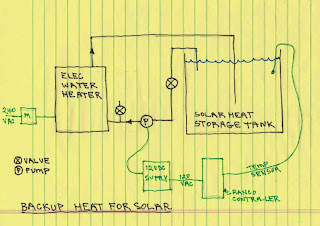 Diagram of the new backup heat system -- really simple. There is also some discussion of other alternative backup heating systems -- I'd be interested in hearing any ideas on a better way to do it. Hey Gary. The first thing that occurred to me is whether there's an argument for adding the new cylinder to the radiant loop feed? A bigger cylinder would probably be required to allow it to keep up, but it keeps things simple. The 3700 watt electric water heater I picked will provide about 12,600 BTU/hr which is above our design heat loss for the part of the house it heats, so I think it will have plenty of capacity. It transfers its heat to the 200 gallon solar heat storage tank. If you had a larger space to heat, especially if not well insulated, it might be hard to get an electric water heater with enough capacity, but it works OK in our case. Sorry Gary, I didn't make myself clear. 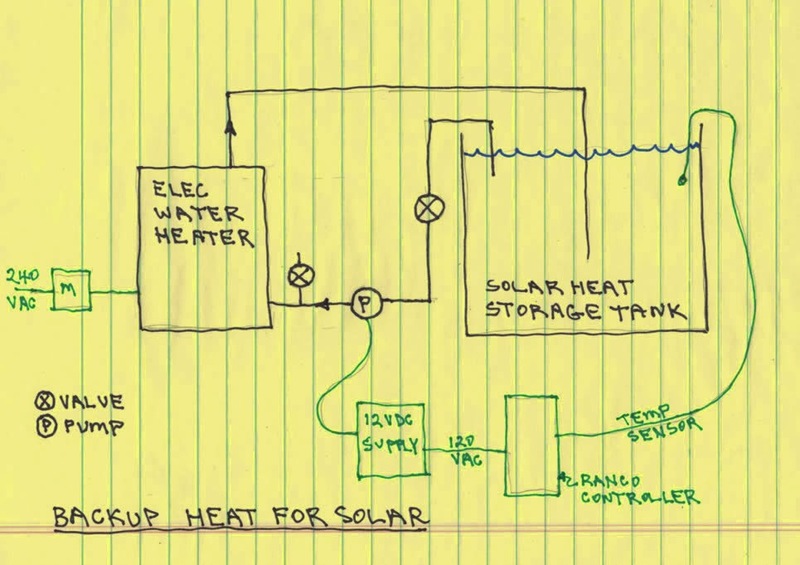 I was thinking that if the new cylinder sat forward of the pump for the radiant loop, you could effectively use it as a boost for the solar heated water in the heating circuit. It would remove the need for the 12v pump and the controller set.